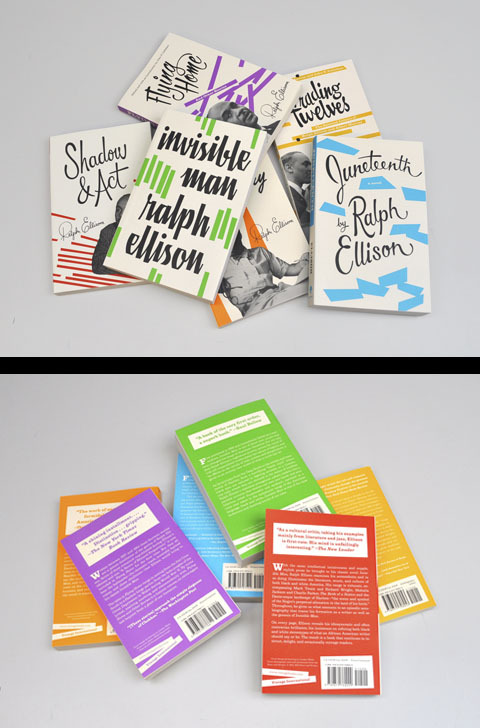 See six jazzy new covers for classic Ralph Ellison titles. Ralph Ellison, one of the foremost African American authors of the literary canon, fell in love with music before he focused on writing. That’s why designer Cardon Webb researched record art and type from the mid-century jazz era to create fresh new covers for six of Ellison’s seminal works. They’re a change from the muted packaging his books have been getting for years in that they celebrate the raucous, colorful energy of his prose. Click through for a sneak peek at the new editions — including Invisible Man, the posthumously published Juneteenth, andFlying Home — which will hit bookstores in September. Visit Entertainment Weekly for full feature.